Hollybeary Creations : YNS DT Dare..
Hi everyone.. Happy Sunday!! Each Month the Design Team is challenged to a Dare at Your Next Stamp.. This month our Dare is Sparkle & Shine!! I used the fun new set Santa's Helpers to create a scene and I colored the images in with Copics. I masked the images off and created the background with some Distress Ink and a blending tool. For the Sparkle and Shine on my card I added some Glossy accents to the snow areas and then I added some Glitter over the top and let it dry. This helps the Glitter adhered better and not fall off everyone. 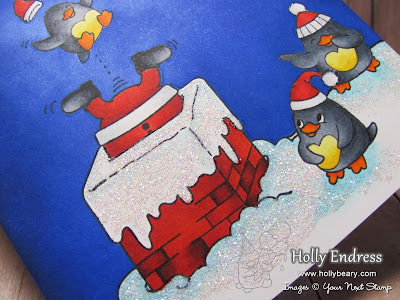 I also added some Clear Wink of Stella to the Hat's on the Penguins. This set is so cute.. and there are some Waddles! 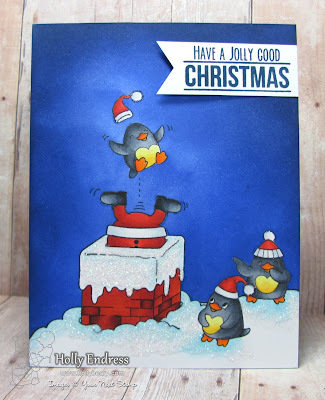 Head over to the YNS blog and see what the other Design Team members created for the challenge and Leave a comment while you are there for a chance to win a stamp Set of your Choice!! Great card, Holly! You did a fantastic job of creating a bright, cheerful and playful scene. It really made me smile. Oh Holly! THIS card is sweet!